The FIAT 500X line-up is simplified to three models. The available packages changed to give customers a better way to customize the 500X to get exactly what they want. 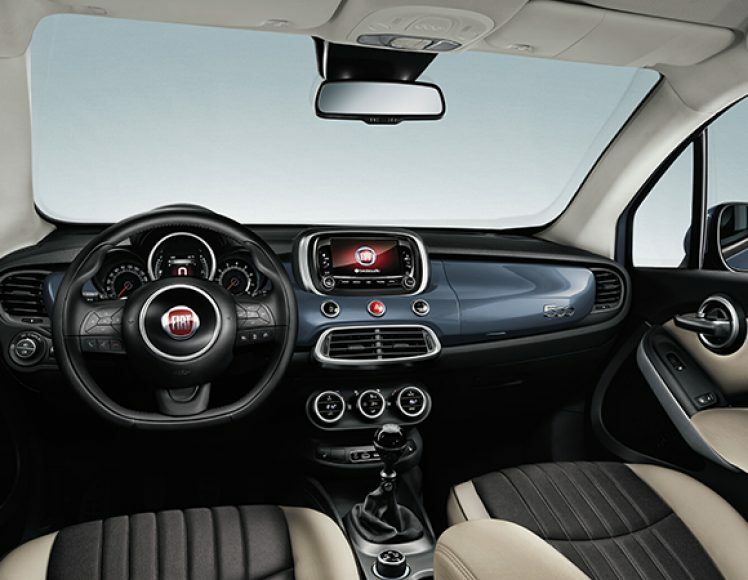 It boasts iconic Italian style combined with contemporary design for a modern small crossover. It features advanced drive systems that give amazing performance, fuel economy, and spirited driving. The model offers two engines, an automatic transmission, and all-wheel drive with disconnecting rear axle. The 500X is loaded with 70 safety and security features. It also offers advanced technology that keep you connected and hands-free. The 500X offers even more features, read along below to learn all about them! There are a couple engines that are under the 500X's hood. The Pop model comes standard with a turbocharged 1.4-liter four-cylinder with six-speed manual transmission and front-wheel drive. It is rated at 184 pound-feet of torque and 160 horsepower. The Trekking and Lounge models comes standard with 2.4-liter four-cylinder with a nine-speed automatic transmission and front-wheel drive. There is an available all-wheel drive system to add to the 500X which powers the front wheels and can send half the power to the rear wheels when the front wheels lose grip. The 1.4-liter engine has a fuel economy of 26 mpg in the city and 34 mpg on the highway. The 2.4-liter engine has a different fuel economy for the AWD and FWD. The AWD gets 21 mpg in the city and 30 mpg on the highway. The FWD gets 22 mpg in the city and 31 mpg on the highway. The 500X has the Pop, Trekking, and Lounge models. The Pop includes full power accessories, remote locking/unlocking, heated mirrors, cruise control, a driver information display, air-conditioning, height-adjustable front seats, a 60/40-split folding rear seat, a fold-flat front passenger seat, and a four-speaker sound system. The Popular Equipment package offers automatic headlights, rear parking sensors, a rearview camera, Bluetooth, front and rear floor mats, a 5-inch touchscreen, leather-wrapped shift knob and steering wheel, and a six-speaker audio system. The Trekking comes with all the Pops features plus foglights, privacy glass, adjustable drive modes, an upgraded information display, height-adjustable cargo floor panel that can be removed, and upgraded cloth upholstery. The Popular package for the Trekking adds a rearview camera, roof rails, ambient interior lighting, dual-zone climate control, a four-way power passenger seat, and an eight-way power-adjustable driver seat. New Yorkers will love the Cold Weather package with heated front seats, windshield de-icer, and heated steering wheel. The Lounge has all the features above plus a rear cargo cover, an auto-dimming rearview mirror, and an eight-speaker audio system. Can you help me with financing a new car? Do you have any new vehicle specials? What are the color options for the FIAT 500X? The exterior color options are Nero Cinema (Black Clear Coat), Blu Venezia (Blue Metallic), Verde Toscana (Green Metallic), Bronzo Magnetico (Bronze Metallic), Giallo Amalfi Tristrato (Tricoat Yellow), Grigio Arte (Gray Clear Coat), Grigio Argento (Gray Metallic), Arancio (Orange), Rosso Passione (Red Hypnotique Clear Coat), Bianco Gelato (White Clear Coat), and Rosso Amore (Tri-coat Red). The standard equipment fitted to make the 500X safe are traction and stability control, anti-lock brakes, active front head restraints, hill start assist, front side airbags, side curtain airbags, and a driver knee airbag. The Trekking and Lounge can have the Advanced Safety package that offers automatic wipers, automatic high-beam control, a forward collision warning system with automatic braking, blind-spot monitoring with rear cross-traffic alert, lane departure warning/mitigation, and rear parking sensors. Come down to Alfa Romeo FIAT of Larchmont to see the 2017 FIAT 500X.